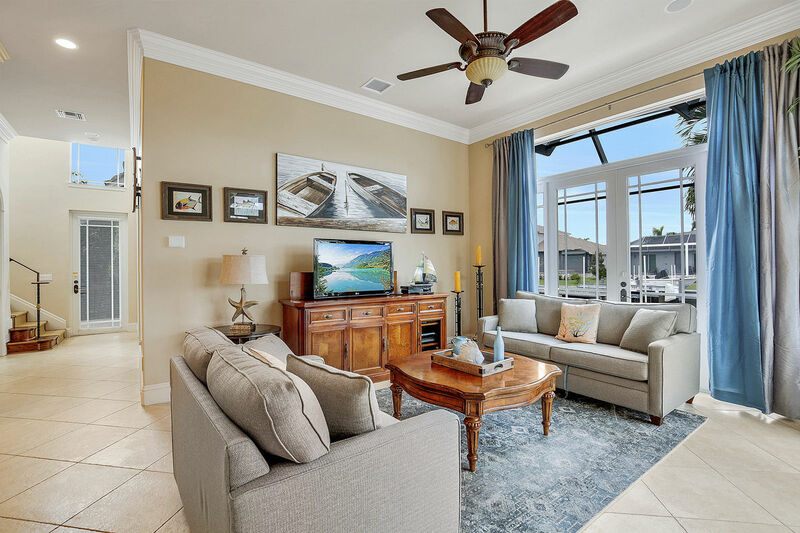 Gorgeously decorated with all new furniture by an interior designer, this Pet Friendly 5 bed 3.5 bath home located walking distance from the beach, provides everything you need to have a luxurious vacation on Marco Island! 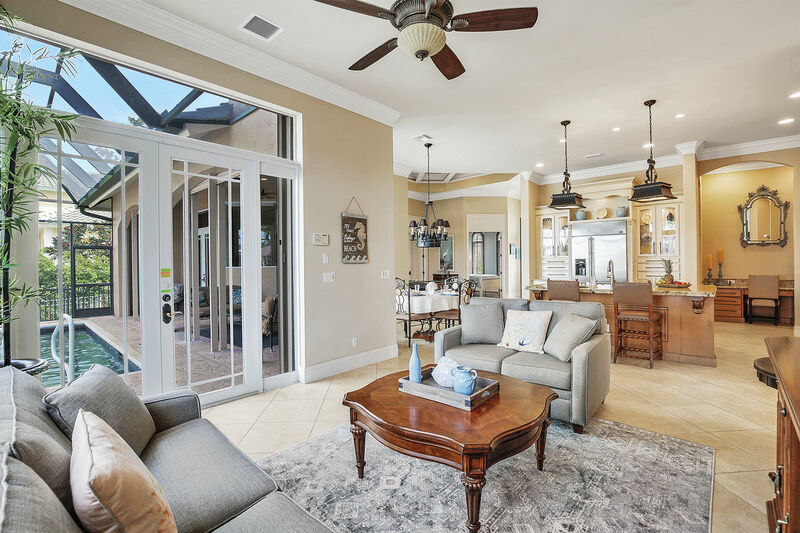 The volume ceilings and abundance of windows give an open and airy tropical feeling with plenty of natural light. 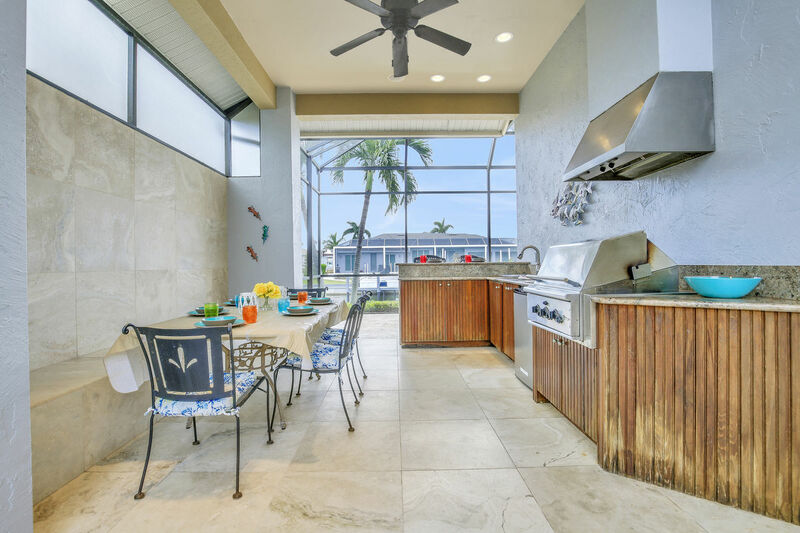 The home offers a contemporary bright and open fully equipped chef's kitchen that opens out to a large lanai. 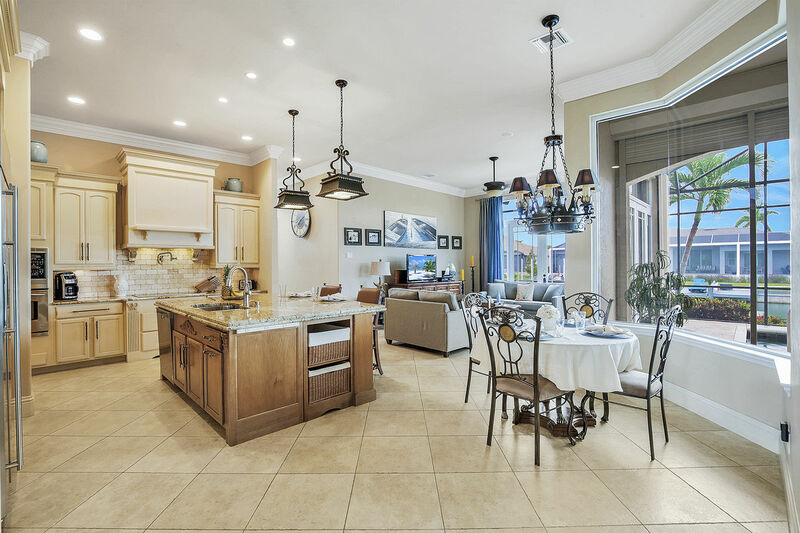 With over 3690 square feet on 2 floors, this home is spacious enough for the entire family. 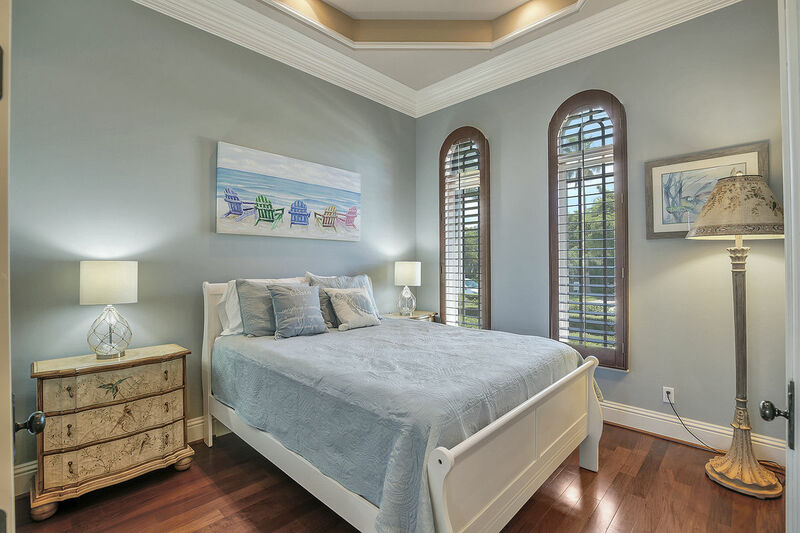 Every bedroom in the home is spacious and inviting. 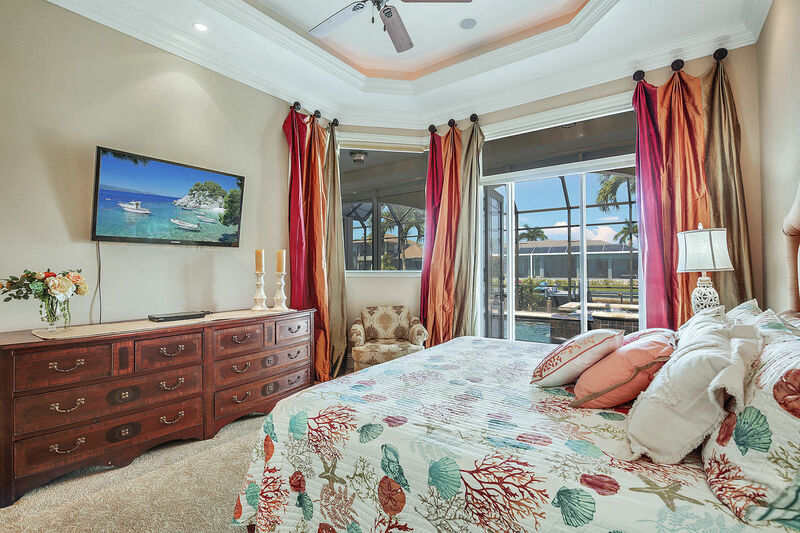 The 1st floor offers a master bedroom sized for a king including a walk-in closet, access to the lanai/pool area and a beautiful water view. 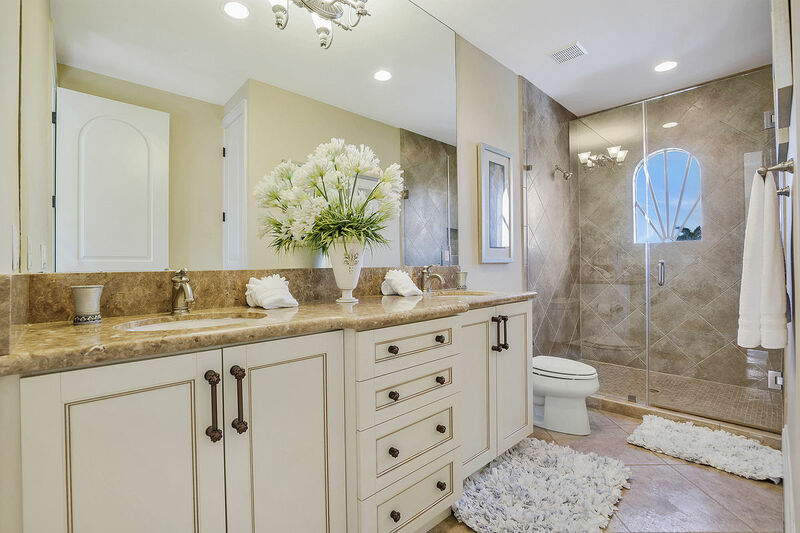 The connecting master bathroom offers a shower, hot tub, his and her sinks, and a separate toilet room. 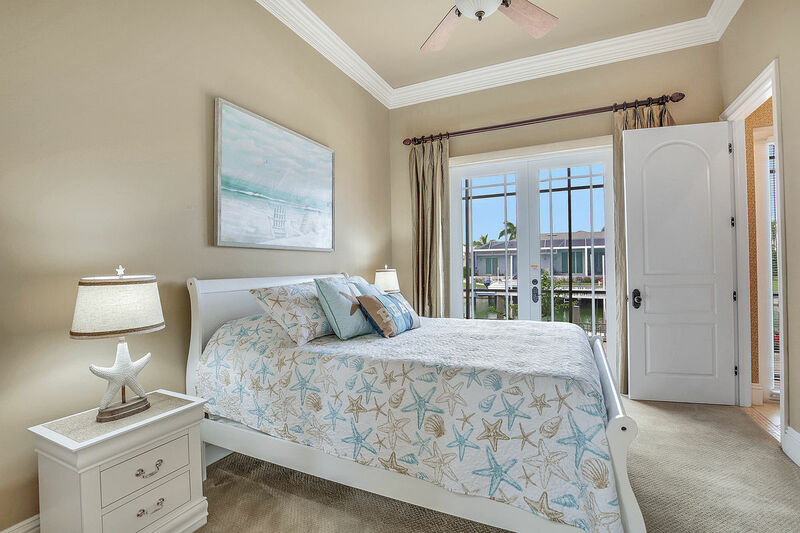 The 2nd bedroom is also located on the first floor with a queen size bed, access to the lanai/pool area and a water view. 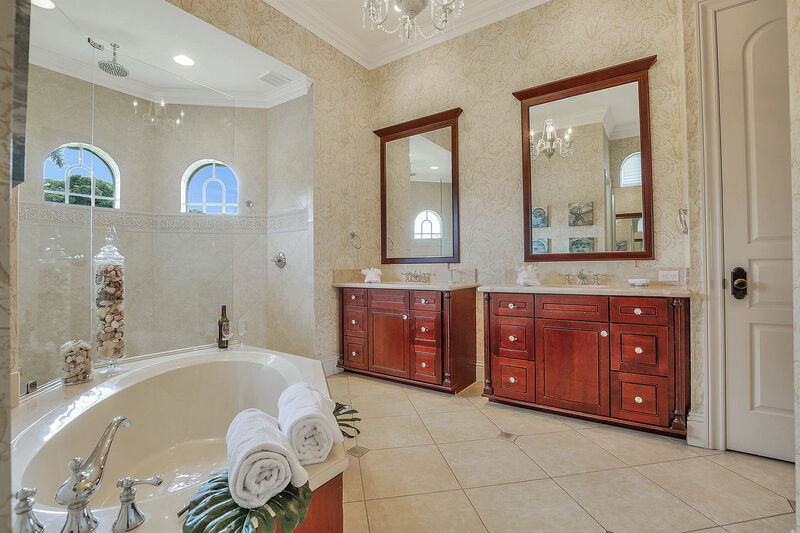 It also has its own bathroom with a shower and access to the lanai/pool area as well. The 3rd bedroom is on the first floor where the office used to be, offering a comfortable queen sized bed. Out in the living room on the first floor you will find a brand new set of couches, one of which is a queen sized sleeper couch that will accommodate 2. 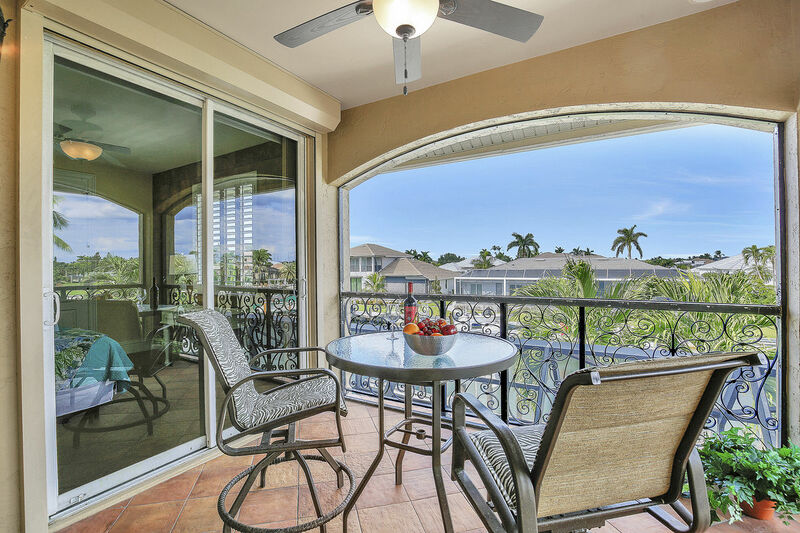 As you walk up the staircase you will overlook Marco Island out the 3 large bay windows before you reach the 4th and 5th bedrooms. The 4th bedroom has a king size bed with a wall full of closets. 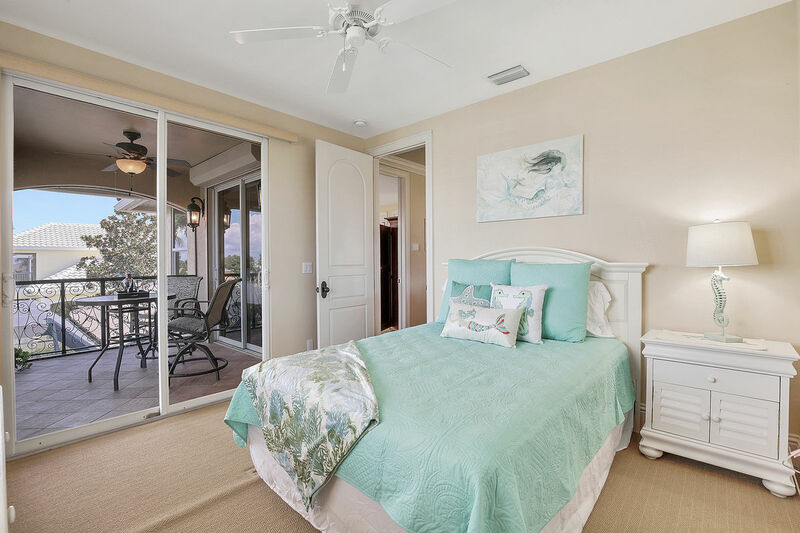 This room has access to the shared second story balcony, perfect for enjoying a cup of coffee as you watch the dolphins play in the water below. The 5th bedroom offers you a queen size bed with access to the shared balcony that gives breathtaking water views. 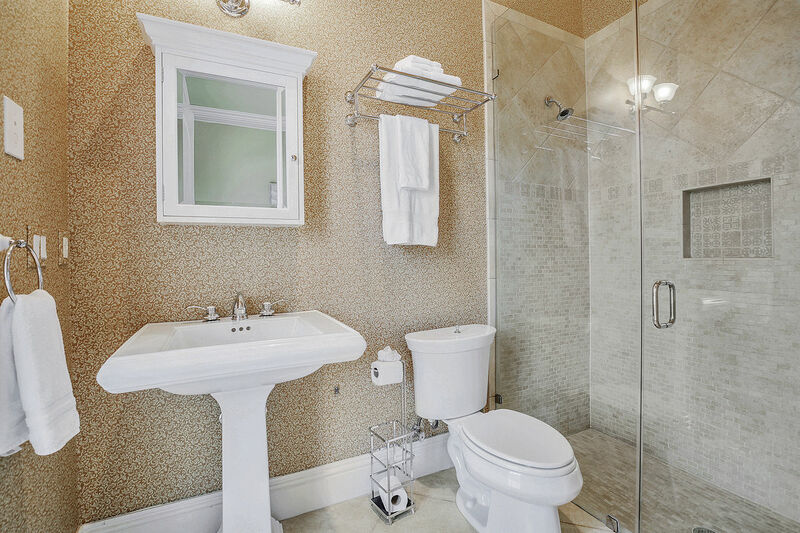 Also located on the 2nd floor is a bathroom shared by both bedrooms. 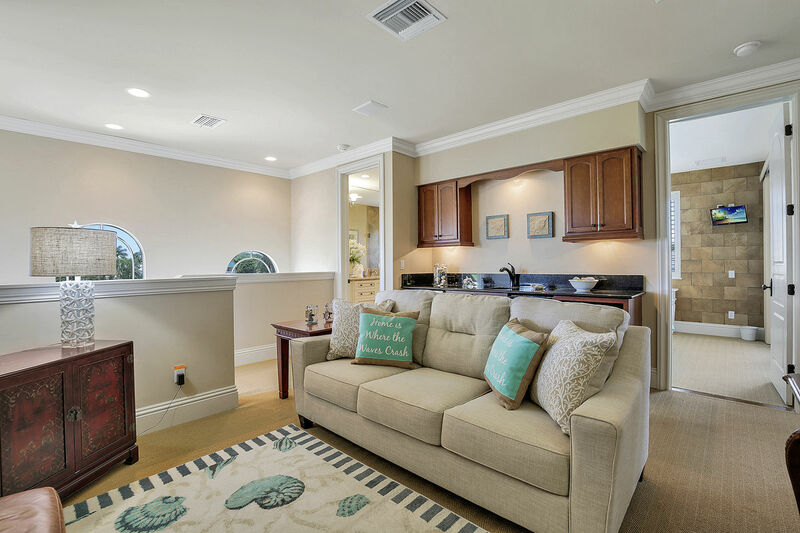 This home has a separate living area on the 2nd floor with a TV, queen sized sleeper couch that accommodates 2, and a kitchenette for making coffee or tea. 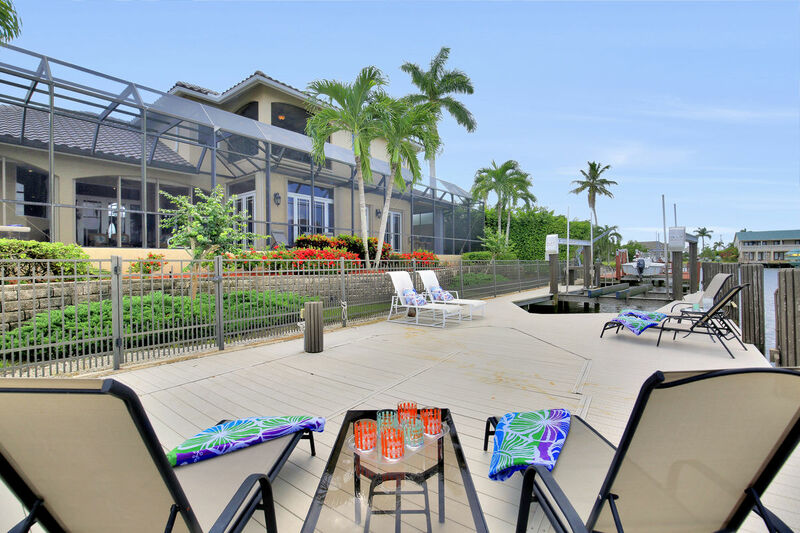 The spacious lanai features a beautiful canal side pool and spa with plenty of room for relaxing in or out of the sun. The built in BBQ grill is a dream for every outdoor chef. The outdoor dining table seats 8 plus a bar area seating 2. The home also features a large boat dock and 3 car garage. 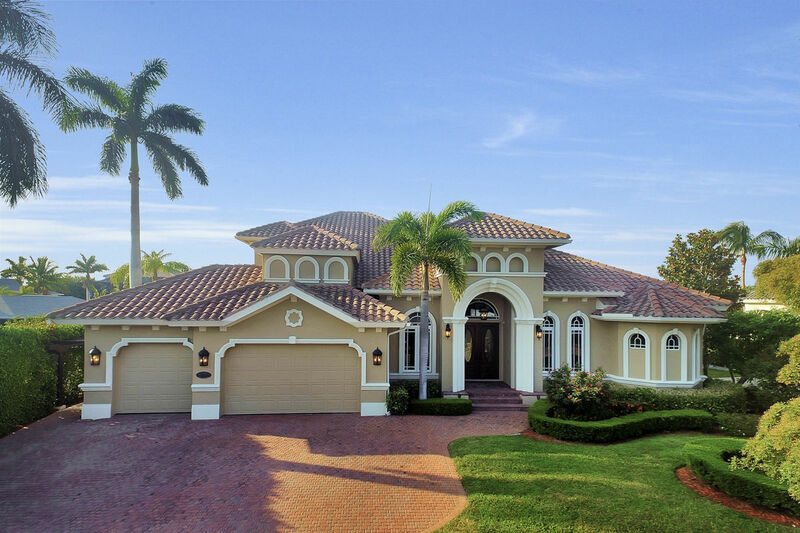 You will have the perfect opportunity to live like a king in this home on Marco Island. Awesome! House has EVERYTHING needed for all age groups and we felt there was lots of space! Within an hour of us finding the house we went onto the dock and saw dolphins and a Manatee in the water! Awesome! We relaxed in the spacious luxury home and found it fully equipped with everything we needed and more! 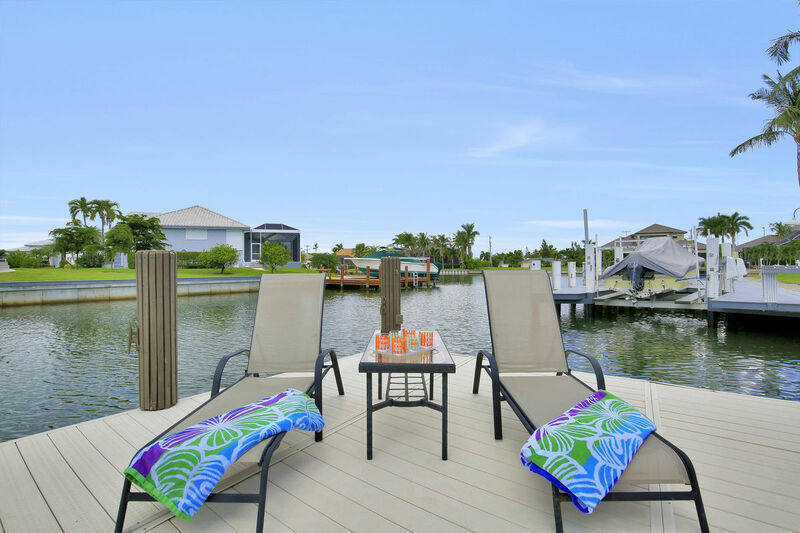 Everything is in brand new condition and absolutely spotlessly clean everywhere, pool and hot tub were fab and outdoor kitchen grill eating area under cover was perfect for shaded evening dining and lunch and we had breakfast on the dock watching the fish and boats go by every morning! definitely booking again next year! This is a beautiful home in a great location close to the beach and a short walk to a wonderful little square full of restaurants and stores and even a movie house. Loads of room to spread out without getting on top of each other, and the upstairs with its own patio and little area to make tea, coffee etc made it very private for those that didn't want to have to come down to the main kitchen in the morning. Everything was brand new and the kitchen is a cooks dream. It has a great pool with a hot tub and a great outdoor kitchen where we grilled out the nights we wanted to stay home. 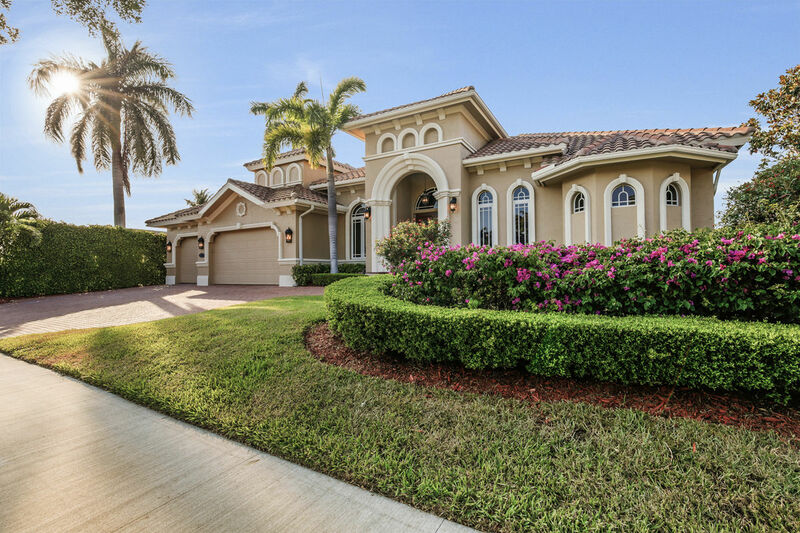 Would highly recommend this beautiful home on Marco, we will definitely be coming back. Luxury enjoyed every single minute here- no complaints!!!! Luxury rental near to everything. Including beach, movies, shops, restaurants, grocery store, pharmacy, doctors even.....luxury linens on beds made it heavenly, upstairs TV den with kitchenette perfect for my kids when they got tired, they made their own popcorn and snacks and watched movies while we lazed by the pool and spa, jet ski rental just at end of street made it easy to book too! Marco Island is a great place to take a vacation. The weather was perfect and the house was more than we'd hoped for, gorgeous.and immaculate. We were four adults and 2 children and there was more than enough room for all of us. We cooked out in the outdoor kitchen most nights, then sat out by the pool or down on the dock, perfect. The kids loved to fish on the dock and loved it when dolphins came to play. The house is beautifully furnished and very comfortable, it had everything we could have wished for and will certainly recommend it to family and friends.Can't wait to return. 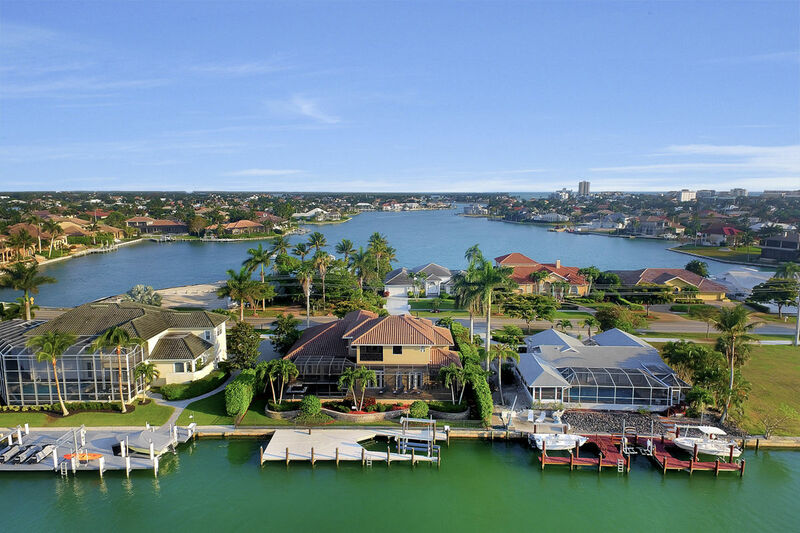 Marco Island is a wonderful place to vacation. The island is gorgeous, fabulous beaches, miles and miles of sand, many restaurants to choose from, there is even a movie theatre. We were never bored there is so much to do and Naples is just 25 minutes away, although we didn't feel the need to leave the island. The house was amazing, even better than it looks in the photos and it was stocked with everything we could possibly need. The house is huge so we had plenty of places to get away for quiet time if we needed, our dog loved the back yard which is fenced and the kids loved the pool and the dock, watching for dolphins and manatees. I would highly recommend this house, it was immaculate and in a great location. Can't wait to go back, hopefully next year. 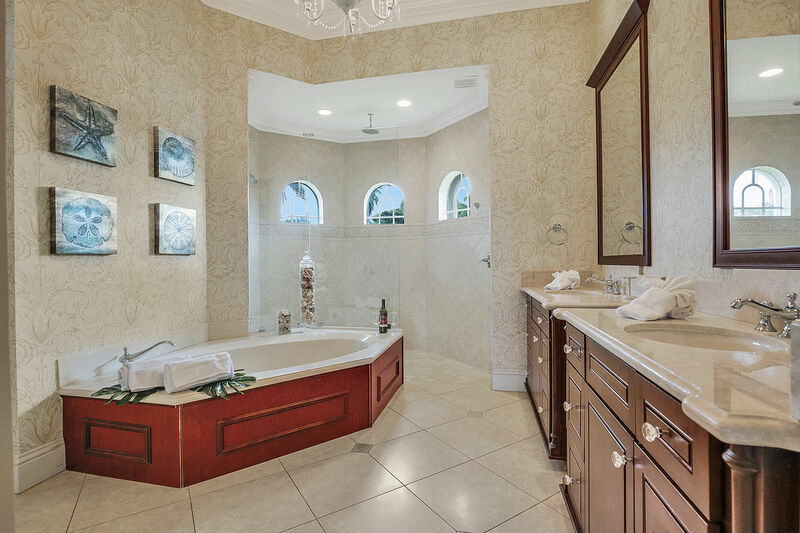 I,d never been to Marco Island before and didn't really know what to expect from a holiday home, but was absolutely stunned by the luxury of this house. Often the brochure glams up a property, but this was far better than we hoped for. The kids in particular enjoyed evening fishing from the dock while we sat in the hot tub and watched. The beaches, shops and restaurants were easily accessible The rental agency were very friendly and were happy to help with questions about the area. Would definitely recommend and hope to come back to this house again soon. 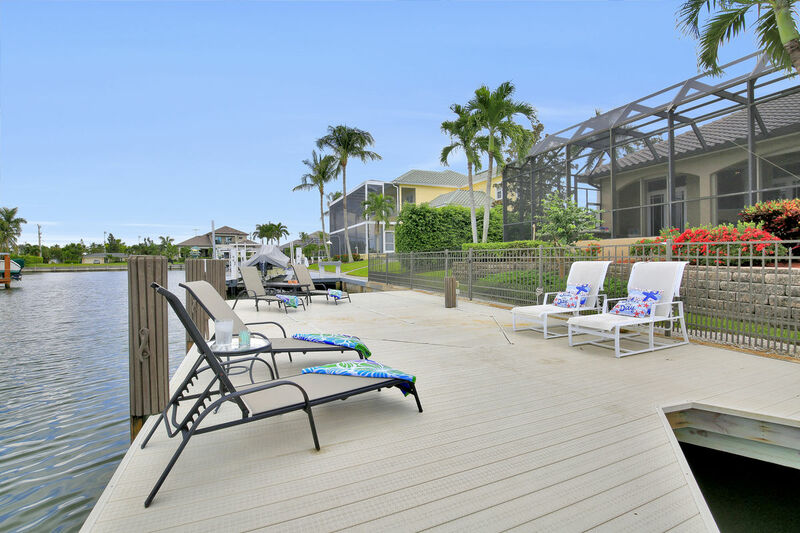 We couldn't have asked for a more beautiful home for our stay on Marco Island! The house is very large and so comfortable! Everything was immaculate and the house had absolutely everything that we needed! The outdoor area was fabulous with the pool, hot tub and dock. We saw dolphins and manatee every day! What a delight! There is a beautiful outdoor cooking area which we used on several occasions. Marco Island itself is wonderful! Lots to do besides the beach! Restaurants, shopping and movies! We will definitely be renting this house again and again! My husband & I just returned from our stay in Marco Island. We enjoyed this beautiful home along with my Sister & Brother-In-Law. The photos are spot on. The home was impeccable. Clean, comfortable, quiet, spacious, I could go on and on. Everything was truly top notch. We were so pleased with the home that we would highly recommend it to anyone who wants to visit the island. It is within walking distance of a public beach entrance, so my Sister & I walked most mornings to the beach for shell hunting. There are beach chairs & umbrella in the garage and we put them to good use. We had the pool & hot tub heated so we could enjoy during our stay. *My husband & I are from Texas, so I am quite partial to a warm pool!. We saw dolphins in the canal, and my husband saw a ray as well. We didn't use the outdoor kitchen, but it was a fantastic set up, just right if you wanted to cook a meal and enjoy the outdoor space. There are lots of good restaurants nearby. We loved Doreen's Cup of Joe for breakfast, The Philly Grille for lunch and dinner. I will say that some places have odd hours, so pay close attention. We had a hard time finding somewhere to eat Sunday evening... Everywhere we went was closed. We ended up ordering pizza from Joey's. That was our good luck as it was a really good pie! The management company was great to work with, very responsive and helpful. There were only two things that I do want to note. The washing machine is set on a platform and when we washed a load of pool towels, it almost "walked" off of it. We kept a very close eye on it after that to make sure it wasn't in danger of falling off. The other "problem" was the lack of a window covering in the upstairs bathroom. The window is in the shower, about chest high. If it were higher, it wouldn't have been a concern, but with the size and location, it did pose a privacy concern. These two concerns were so minor in our overall experience. We would definitely rent this home again! The place is larger than it appears in the pictures, very rich and elegant. I appreciated the shade opportunities around the pool being bald and all! Pool heater and system in general was broken for the first 2 days of our stay and due to the weekend arrival was not resolved will noon on Monday. Other than that it was a very nice vacation. Beautiful home and great location! Bicycles will take you anywhere you want to visit across the island. Had a fabulous 2 weeks and would highly recommend this property! This house was perfect for the 7 of us. Beautiful pool and outdoor kitchen. Close to everything. My family will definitely rent this house again!! Eagerly Anticipated and Did NOT Disappoint! This property was spectacular! There was not one thing we would have changed about the location or the home! It allowed for quiet cups of coffee pool or dock side or for a more robust family dinner! 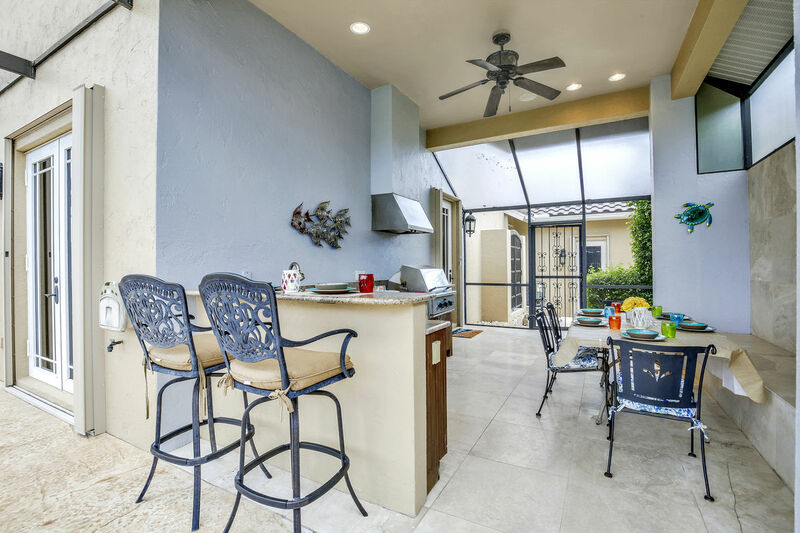 And the Summer Kitchen...what a nice option! The beds were beyond comfortable! An enjoyable walk to the white sandy beach! Everything you needed for the beach was right there for your use. The neighborhood was quiet. Simply the best location ever! Did not want to leave and are already talking about coming back again! Thank you! We have a wonderful stay at this property. It was furnished beautifully and was stocked with everything we needed. We also enjoyed the pool and outdoor area. We enjoyed our stay in your beautiful home! Very nicely designed home with nice decorations. Everything was very neat & clean. 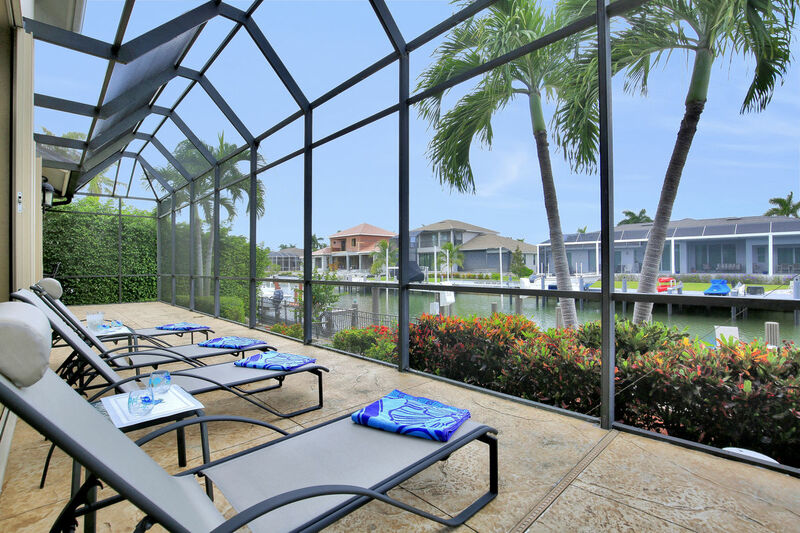 We would recommend this house to others who want to stay on Marco Island. It was a bout a 10 minute walk to the beach. Cleanliness is important and they really did a great job! Had the best vacation ever!!! 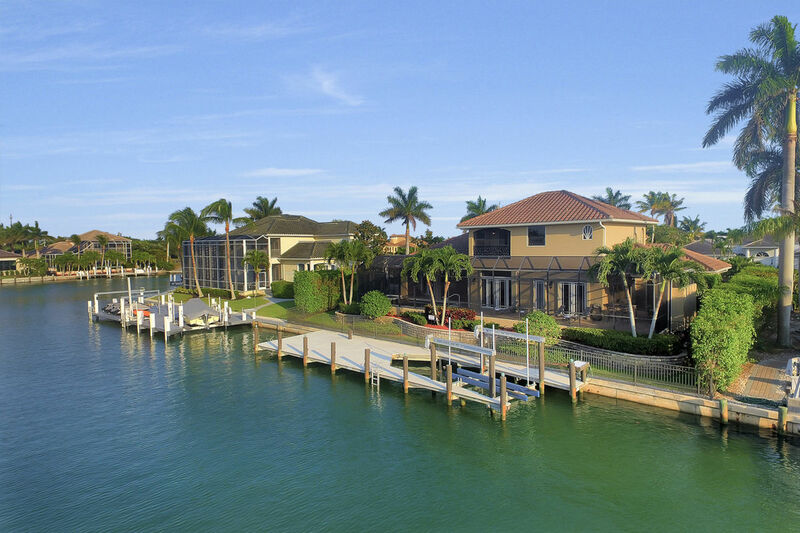 Gorgeous Home on Marco Island! This is such a beautiful home on a beautiful island!! The house was in pristine condition as was the pool, hot tub and outdoor areas. We spent much of our time outdoors and it was just perfect! We even saw dolphins and manatee! The outdoor cooking/eating area was such a ice addition! The house is large and I loved the separate upstairs area where you can make tea or coffee and keep cold drinks. I liked to wake up early, make my coffee and go sit on the private deck without disturbing anyone! I will definitely be renting this property again in the future! 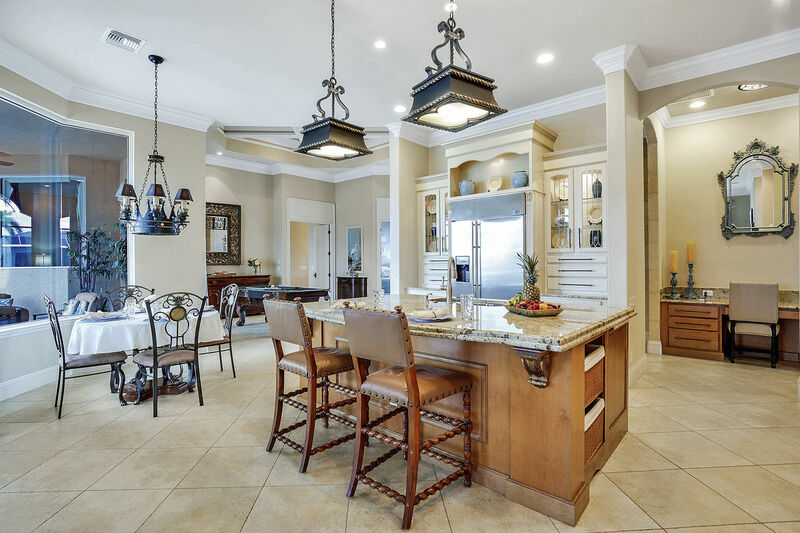 Everything you could want in a luxurious but not "stuffy" home. High quality, very clean, and in a location that's quiet yet a walk to the beach (or quick drive/drop off of the family), and the main attractions (restaurants, stores, etc.). Well equipped with whatever you need on vacation. 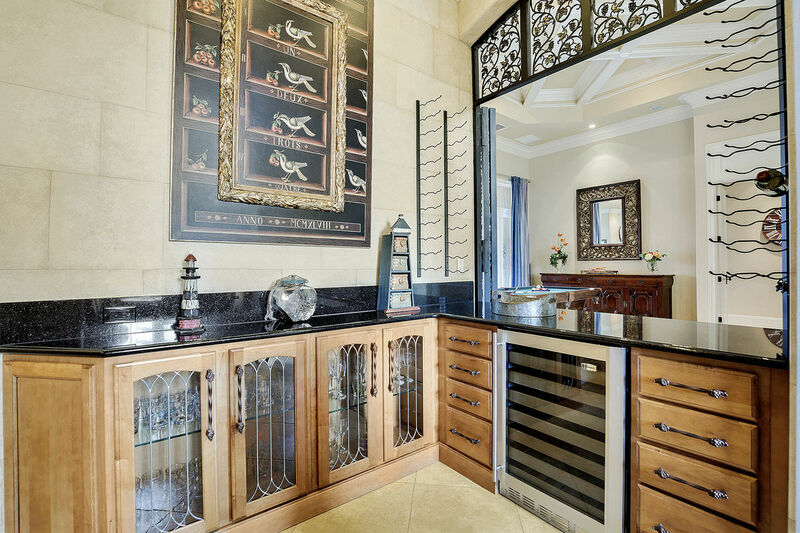 (you will however need to bring everything in the kitchen for cooking beyond pots, pans and utensils, i.e. oil, spices, the basics, and plastic wrap, bags, foil... since everything is cleaned out before you arrive. There's really no lawn if that's what you're looking for, and the sun doesn't hit the pool/back porch. But the big dock is great for sunning, hanging out and has a few lounge chairs (a couple need to be replaced). Very little boat traffic. Our whole family loved the house and it was very clean. Had everything we needed and very close to the beach. The kitchen was huge and gorgeous!! We rented two kayaks and had a blast. The nicrowave broke one day and they came to fix it the same day. Very good service!!! 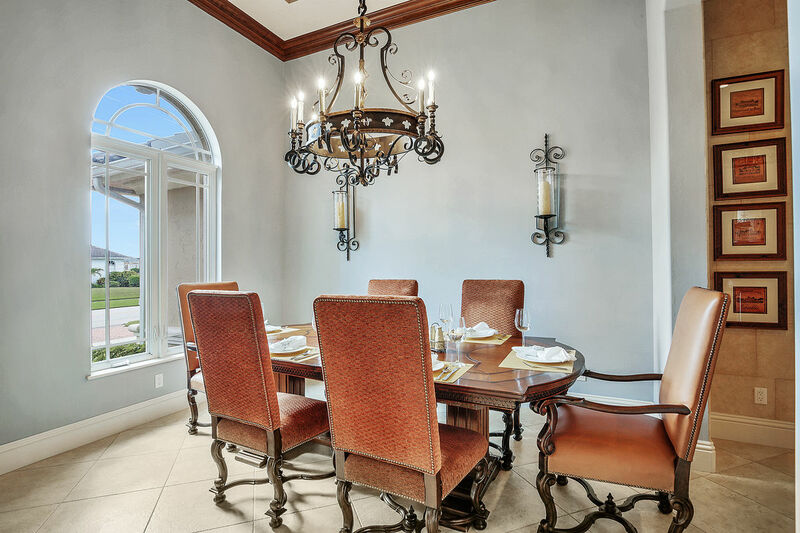 Such a beautiful home that offers scenic views, easy access to the beach and shopping. This is our second stay here and will likely not be our last! 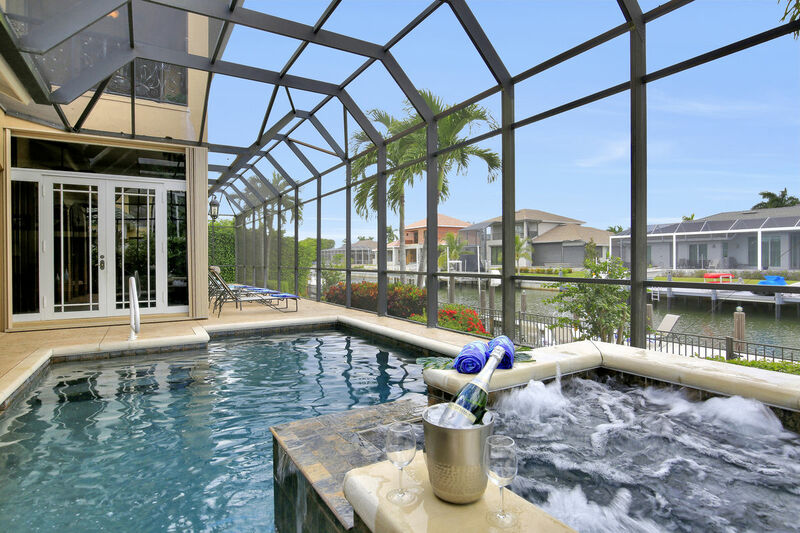 We would highly recommend the 1288 Winterberry to anyone who is looking for a luxurious and relaxing vacation. The house came full equipped with everything from floaties for the pool, fishing rods, bikes, and grilling tools. We loved this house and never wanted to leave. We loved our stay at this gorgeous house!!!! The moment we walked in, we were blown away by how beautifully decorated, spotless clean, and spacious it was. We cook all our meals and this house has every kitchen gadget/appliance/tool a cook needs and more! Pots, pans, dishes, utensils, disposable and plastic dishes for the pool area... The beds were very comfortable and everything was soo clean. There were plenty of towels, beach towels, bed sheets. The beach is just 15 mins walk away or 5 min drive (we walked most days as we love walking). When we were too lazy to go to the beach, we hanged out in the heated pool and jacuzzi and on the boat dock. A huge plus for us was the fact that we could bring our golden retriever dog with us, as most vacation homes do not allow pets. We recommend this house to all our friends! It's truly an amazing house. This was our first time vacationing in Marco island and we fell in love. We will definitely come back! We had an amazing time in Marco again!! The house was beautiful, specious and clean. There were 14 of us with kids age between 7 to 13. We enjoyed the pool, hot tub and the beautiful view of the canal. We also liked the outdoor patio grill area where we cooked for everyone. Excellent location close to shopping and restaurants. Highly recommend! We will be back next winter break. 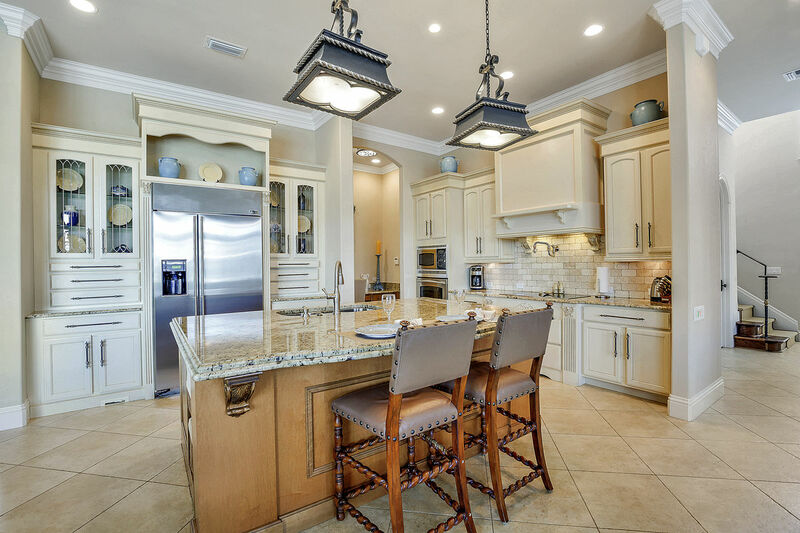 This home was exceptional for our family! We would definitely rent again. Easy walk to the beach. Our family of 6 adults and 2 children enjoyed the pool, hot tub, pool and beach toys, bikes, coolers etc! !